A One-Man-Show starring Randy Noojin! 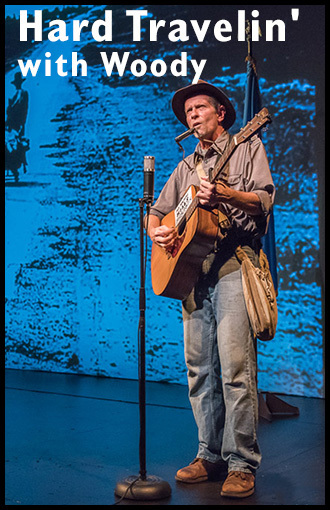 Hop a box car through the Dustbowl with Woody Guthrie and commune with the spirit, stories and songs of America’s iconic folksinger, saint-of-the-workingman and poet-of-the-people in this critically acclaimed, award-winning multimedia solo show packed with Woody’s spirit, music and artworks. “I had been looking for a subject for a solo show to write for myself and Woody’s views on income inequality, brutal police, the mistreatment of migrant workers, unfair wages and working conditions for laborors were so close to my own views, I wouldn’t have to “act,” but just express my own concerns, using Woody’s words and songs. There is plenty of Woody-in-his-own-words available to choose from, thanks to his autobiographical novel, Bound for Glory, a collection of his articles for People’s World magazine called Woody sez,, plus Library of Congress recordings of his interviews with Alan Lomax, and other collections of his writing.” Click Here to learn more!